Laminate flooring is often overlooked when tackling a new room or multi room flooring project. Recently, Studio helped me to source a wonderful DIY laminate flooring option. IT TURNED OUT BETTER THAN I COULD HAVE HOPED! 1) Cost– Laminate floors are much more affordable than hardwoods, especially if what you want is a worn wood look. Each package of the laminate contains 10 different pieces of the flooring. No matter how you put it together – it looks awesome! 2) Durability– Laminate floors are just more durable. I accidentally dragged the stove over the new floor with a broken leg and the floor did not even show a sign of a scratch. The pros at Studio know their flooring and want you to enjoy your product for many years. 3) DIY friendly– The laminate was so easy to install, I did an entire apartment myself in about 5 hours. It was easy to cut with only a carpet knife and there was no glue required. I came with a built in cushion, so there was no need for a sub-floor. Installing laminate flooring from Studio Floors was a great process. 4) Aesthetics- Everyone that has seen the flooring that Studio provided has commented on how good it looks. 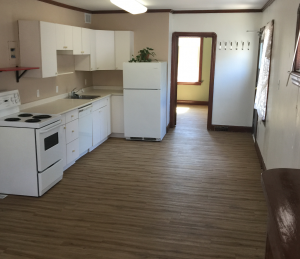 The first tenant that viewed the apartment after the flooring was installed leased the space! It completely changed the look of the room. For all of my renovation needs, I am going to lead with flooring recommended by Studio. 5) Studio Advantage– I feel 100% confident that I made the right flooring decision going with Studio Flooring. They back their product with a the best guarantee in the industry. For anyone in Winnipeg or Manitoba looking for the best flooring product, Studio must be first on your list.